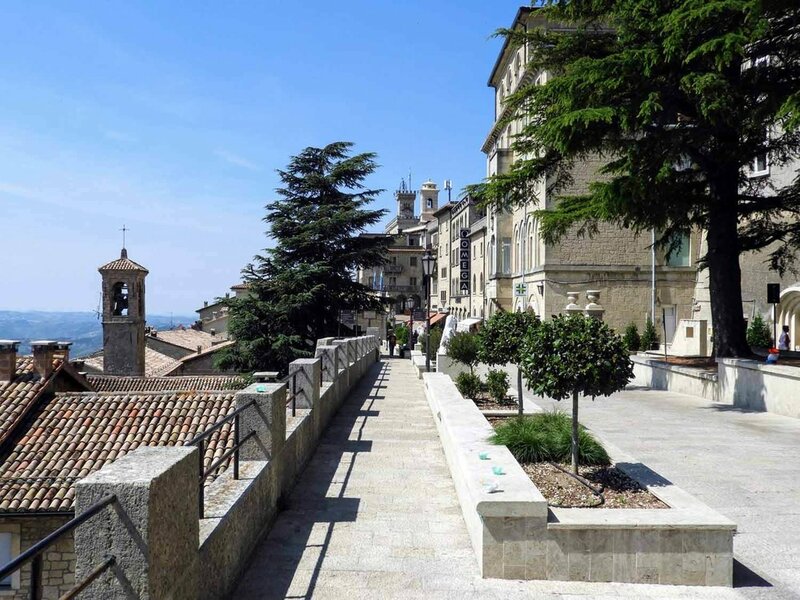 Like many other microstates, people visit San Marino to check another box off of their country wish list, and admittingly, our motive was somewhere along those lines before visiting, but new country or not, we still recommend you go! San Marino is only about 3 hours from Florence and Venice, so it’s easy to add on to your grand tour of Italy. San Marino proudly claims to be the world’s oldest republic (dating back to 301 A.D) and is entirely landlocked by Italy. The fact that it even still exists is a bit curious and quite impressive. The capital city, sharing the state’s name, is nestled on top of Mount Titano and is protected by three cliff top castles, the Rocca Guaita, the Castello della Cesta and the Torre Montale. We only had 3-4 hours in San Marino, but were pleasantly surprised by how quaint it is. Most of our time was spent wandering the capital’s switchback streets, admiring the views beyond and enjoying our pic-nic lunch in a park. Some of group visited Rocca Guaita; dating back to the 11th century, this is the oldest and arguably most significant castle in San Marino. For just 3 euro, you can enter the fortress and check out the landscape from the tower, but the rest of us opted to bask in the sun while indulging in some gelato (when is this ever a bad idea?). Because San Marino is not a member of the EU, it is a shopping destination for many, though it seems a little on the expensive side. Our favorite momento from San Marino is our official tourist passport stamp. Stop by the Tourism Office (Contrada Omagnano 20, City of San Marino 47890, San Marino) to get yours! Don’t forget your wallet. Some would argue the cost (5-6 euro ea.) isn't’ worth it, but if it helps you decide, the stamp is sparkly. Do we need to say more? Last and probably least, San Marino is home to my first “squat and shot” toilet experience. If you’re not familiar with this (as I wasn’t), I think the name is pretty self explanatory. It’s not my favorite, but I’ll gladly take a “free-pee” anywhere I can in Europe as they are few and far between.